RIEGL Introduces the World’s First App for LIDAR Data Visualization on the iPad: RiALITY! Dive into the point cloud! RIEGL proudly announces its new iPad point cloud viewer: RiALITY, now available for free in the iTunes App Store. This new, innovative App, the first of its kind, allows users to experience LIDAR data in a completely new environment. It also allows easier LIDAR data demonstrations through the use of an iPad. RIEGL’s RiALITY App enables users to visualize and navigate through point clouds acquired with RIEGL laser scanners. 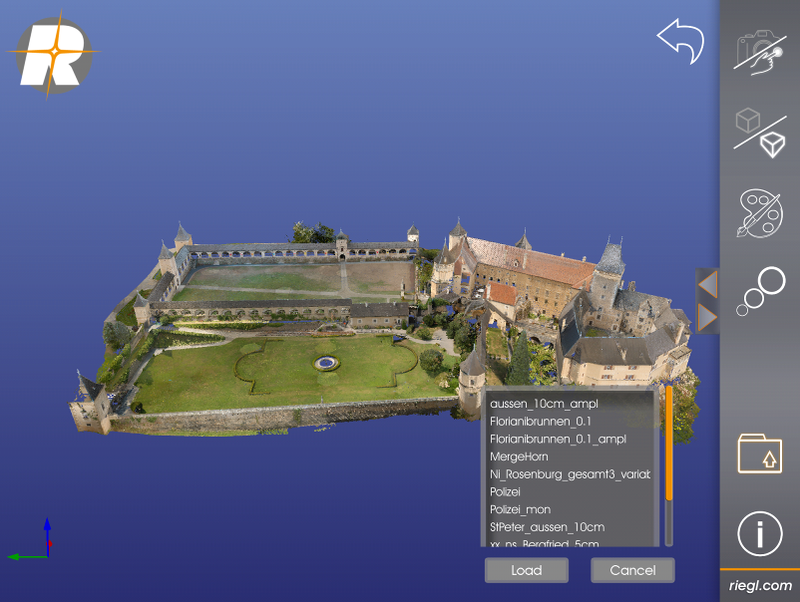 As an example, users are able to explore a dataset of the beautiful Rosenburg Castle in Austria. RIEGL scans can also be imported from RIEGL’s RiSCAN PRO software into the App, as well. “We’re pleased to present a new way of visualizing point clouds. RiALITY delivers this new technology by providing Augmented Reality technology in an easy-to-use app. Now you can easily send your client a 3D point cloud that they can visualize on their iPad, for free.” said Ananda Fowler, RIEGL’s manager of terrestrial laser scanning software. 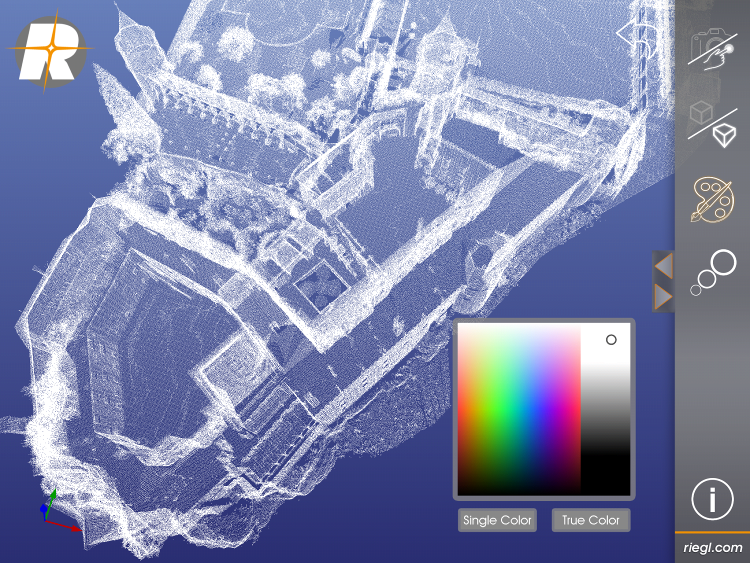 RiALITY features true color point clouds and 3D navigation. In a breakthrough technological development, the app features an Augmented Reality Mode. 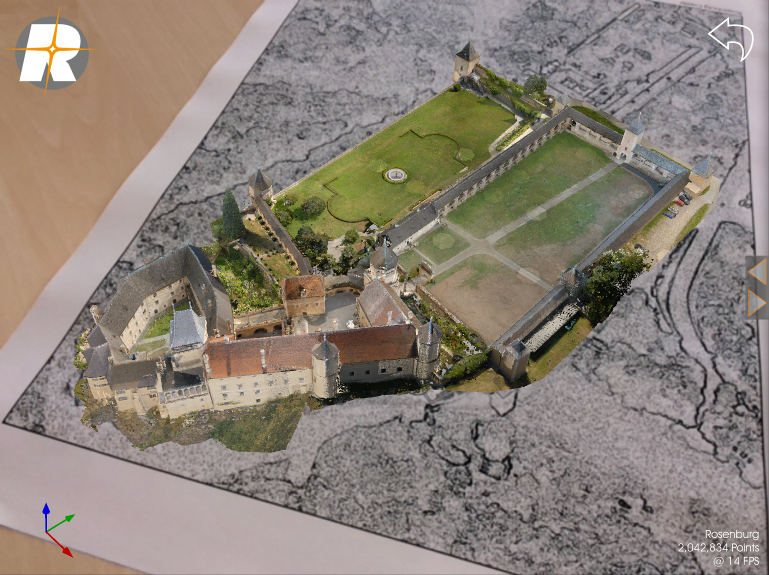 The Augmented Reality Mode allows point clouds to be virtually projected into the real world. Find out more at www.riegl.com/app. RiALITY: Each point of the clouds can be visualized in true color or single color mode. RIEGL Laser Measurement Systems, Austria, is a performance leader in research, development and production of terrestrial, industrial, mobile and airborne laser scanning systems. RIEGL’s innovative hardware and software products provide powerful solutions for nearly all imaginable fields of application. For more information, visit www.riegl.com. Located in Orlando, FL, RIEGL USA is the North American office for RIEGL Laser Measurement Systems, GmbH. With nearly 20 years of experience, RIEGL USA delivers quality airborne, mobile and stationary terrestrial laser scanning solutions. For more information, visit www.rieglusa.com .